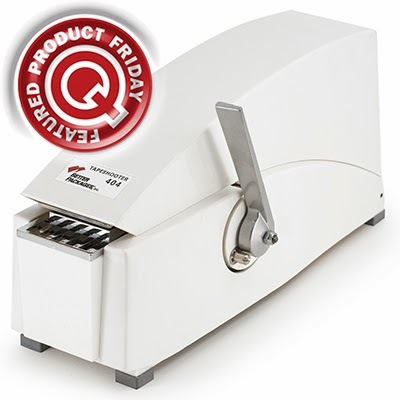 Save 23% off the MSRP on the Better Packages TS404 TapeShooter® 404 Manual Tape Dispenser when you use our FPF020714 Coupon Code. This Featured Product Friday (FPF) promo is valid from today, February 7, 2014 through Sunday, February 9, 2014. Better Packages TS404 TapeShooter (Q Source SKU: B017-000033) is compact to fit on any countertop, offers a secure, professional seal; and is suitable for a variety of specialty sealing applications such as food service, mail room, floral & more. Regularly listed at $169.99, but with our FPF code savings you’ll get it for just $129.99 (a savings of $39.01). While this is a 3-day limited-time price, the coupon is unlimited. Use the code as many times as you like while it is valid—and please feel free to share the code with your friends & colleagues, too. Please note: This promo is valid only at QSource.com.